Who are all these people in my circles? To my astonishment over 560,000 people have put me in their Google+ circles. That is over half a million strangers who want to hear what I say on Google+. That crowd is far greater than the number of people subscribing to Wired magazine during the years I was editing it. Where did these half million people come from? And who are they? Because they are starting to post a lot of spam in the comments. You the reader don’t see much of this spam because Google does a fantastic job of suppressing it so it’s invisible to readers. But as host I see the hidden spam grayed out so that I have the opportunity to undo it in case an entry is legit, but that has happened only once so far. All the other times Google has expertly and accurately removed spam before it displays. Still, there is enough comment spam that it got me to wonder: how many of my circlers are spammers? With the help of my research assistant Camille Cloutier, we randomly sampled my great circle to see who was there. I’ll tell you our conclusion and then how we got there. Conclusion: Most of the half million people following me on Google+ are ciphers. They have signed up, but have not made a single public post, or posted their own image or a profile, or made a comment. They aren’t home. The only place you’ll see people are in the same small set of 100 “recommended” people they follow, of which I am one. That is why I have half a million followers. Not because I have half a million fans, but because I am on a default list to fill an otherwise empty street when folks sign up. Camille paged through a subset of 5,000 of my circlers, and then took 5% of that 1% to inspect closely. So I can’t say this very small sample has any statical significance, but it may serve as a hint. (If you want to inspect the Google spreadsheet with the minute breakdown of what we found it’s here. 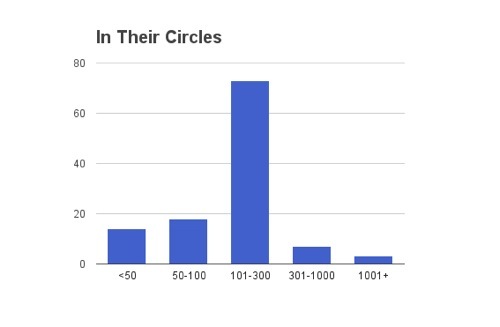 This chart plots the number (out of the sample) of my “followers” vs the number of others who have added them to their circles. This graph plots the number of followers with how many they are following. Most of the ones they are following are recommended “celebs”. What we found was that only 30% of Google+ers made any public activity. And 6% were outright spammers. So the good news is that spamming occurs at a low percentage (and as I said, Google does a marvelous job filtering it out), but the bad news is that most of Google+’s inhabitants are ciphers. Not there. Ghosts. 36% had not even filled out a profile. Now, it is possible these ciphers are busy posting stuff privately on each other’s streams, but that is not the impression I get looking at their profile. It is important to note that this great vacuum may be present solely because my followers are so artificially inflated by the recommendation machinery. I suspect that most normal Google+ accounts not on a recommendation list will have a more organic spread of followers, with many fewer ciphers. So more than half of their Twitter followers are ciphers. This has been verified by PeakAnalytics, which observes that the more followers you have the higher percentage will be ciphers. Presidential candidate Newt Gingrich claims to have 1.3 million followers. But last August a group at Indiana University did an analysis of some of the 2012 Presidential candidates and found that 76% of Gingrich’s 1.3 million Twitter accounts lacked a profile biography. That doesn’t prove they are all fake, or bots, but it does say they are ciphers. Chart from Center for Complex Networks and Systems Research. 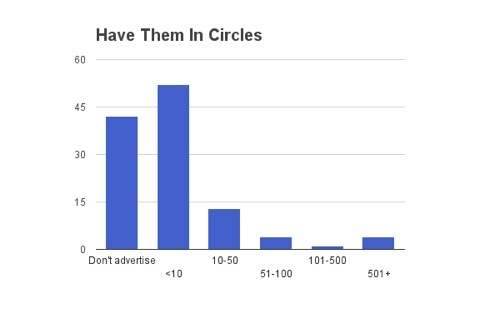 Google, the big data wizard, knows in great detail who is who on Google+. They can tell from activity, links, associations, or lack thereof, who is real or not. Ciphers are a benign problem, unlike spammers. Many of the ciphers are real people, who are inactive now, but might be later. Their inactivity is not hurting anyone. But businesses believing they are there may experience failures. The main lesson of the Social Ciphers is to beware of large numbers in social media. The larger the number, the more fluffy it is. Real or not, these folks are just not there.